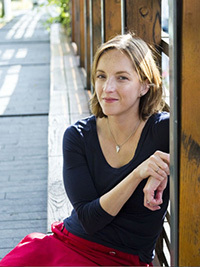 Sycamore Review is pleased to announce that the 2014 Wabash Prize for Fiction will be judged by acclaimed author Rebecca Makkai. The winner, selected by Makkai, will receive a $1000 prize and publication in Sycamore Review. Rebecca Makkai’s second novel, The Hundred-Year House, will be available in summer, 2014 from Viking/Penguin. Her first novel, The Borrower, was a Booklist Top Ten Debut, an Indie Next pick, an O Magazine selection and one of Chicago Magazine‘s choices for best fiction of 2011. Her short fiction was chosen for The Best American Short Stories in 2008, 2009, 2010 and 2011, and has been featured in The Best American Nonrequired Reading, New Stories from the Midwest, Best New Fantasy, and several college literature textbooks. Her new stories appear regularly in publications such as Harper’s, Tin House, Ploughshares, New England Review and Ecotone, and on public radio’s This American Lifeand Selected Shorts. Rebecca teaches StoryStudio Chicago’s “Novel in a Year” workshop, and instructs as well at Lake Forest College and in Sierra Nevada College’s MFA program. Her website is www.rebeccamakkai.com. The contest will close on March 21, 2014. Fee is $15 for the first entry of 7,500 words or fewer, and $5 for each additional entry. Entries must be unpublished, and all submissions will be considered for publication in Sycamore Review. Last year’s prize was awarded to Angie Kim for for her story “Buried Voice.” For full guidelines, please see the contest page.